Just got the the ARCS and am so pleased with the cover. Also the size. It's 200 pages longer than Skin Hunger. It looks good. Weighty. I love the smell of new books. I love this job. 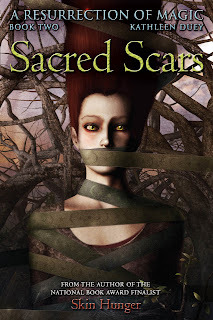 Sacred Scars will be released in August. It's free, of course. You have to sign up for an account, (free, and quick!) choose my book, click BUY (for free) Whooosh...it goes to your library page, click the cover and five pages of excerpts--some from each story, come up. Ipulp is growing fast. Keith Shaw wants to make downloadable stories as easy and available as downloadable music. TWITTER...my very own personal account. Because Russet:One Wing http://russet-one-wing.blogspot.com/ has taken over my twitter account, I have opened a personal one. Theo Black (The Black Arts) and his staff will be doing it. 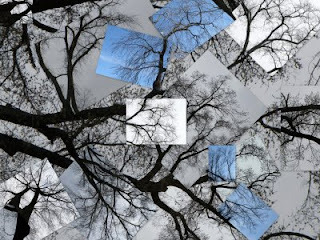 I think I will be using some of my photos as some of the backgrounds. Actually, I am pretty sure of that part. Little else. Design-wise, it'd be so good if I only wrote for one age group. But no. I write for K- YA. So there have to be three sections: One for educators/parents/librarians, one for the youngest readers, and one for teens. So the design challenge is to make each part feel appropriate for the audience and still, somehow, not end up with a crazy-quilt for the whole site. Updates and maybe a few sneek peeks (you know you can't wait?) will appear here. Cyn Smith let me guest blog about the experimental aspect of the Russet novel today. Here is the faculty lineup for SCBWI 09 in LA. I can't believe I am on a list with these people. Just back from Wisconsin schools. Thanks, Steven's Point and Tigerton. Dearest teachers and librarians: you were all wonderful, and your schools are full of capable, smart kids who care about their world. I admire teachers so much. And librarians. They keep this place running. I will speak at Wisconsin State reading Association 2010 and hope to see you all then.